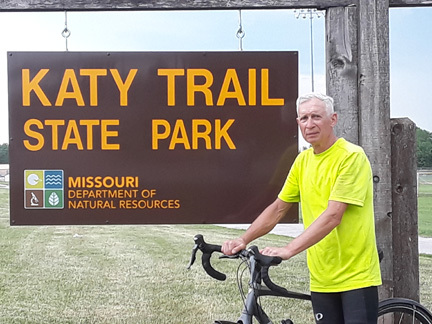 If you are out on the Katy Trail between Sedalia and the East terminus at Machens, MO the week of May 21-26 and see a lone bicyclist heading East,it may be retiree Larry Heyn on his trek across the USA to raise awareness of child abuse. Heyn created a website with his son-in-law, Drew Barber, called shieldthechildren.com, as a repository of all the information Heyn has collected about child abuse. It is divided into two sections, one section for learning, and the other for taking action to stop the abuse or care for those who have been abused. The “Learn” side lists many forms of child abuse that exist and information about each type. The “ACT” side mirrors the “Learn” side. It contains ways for people to personally become involved in each type of abuse. Many are simple, every day, common sense things that will make a difference. 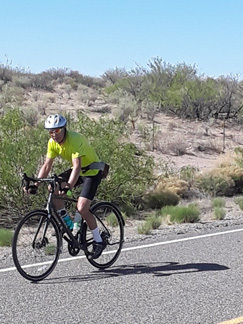 Heyn believes that “it is by small and simple acts that great things come to pass.” He will be extending personal invitations to those he meets along his route to do something to stop child abuse. He says donating to a specific organization is good, but taking personal action to prevent abuse is better. Heyn is a 67 years old retired medical device engineer. He has been married to his wife, Debi for 32 years and has three children and five grandchildren. Since retiring six years ago, he and his wife have volunteered as missionaries for The Church of Jesus Christ of Latter Day Saints in Palmyra, NY, and Yellowknife, in the Northwest Territories of Canada.